The nurses had told me my hair would start falling out 17-21 days after my first chemotherapy. My second round of chemotherapy was on day 15, so the two weeks before the third round was all about head cover. I needed to be prepared as I didn’t know how quickly my hair was going to fall out. I had even taken a scarf with me to Queensland in case my hair suddenly all fell out there. I called it my emergency scarf. If my hair had fallen out, it would have been pretty useless as it was the wrong shape. I had no idea what I was supposed to get when I bought it. One of the things that surprised me the most about this whole cancer business was how hard it was to find scarves. I thought everybody would know where to find them but it wasn’t so. I asked the chemo nurses and they said they didn’t really know but perhaps I could try those little Asian shops that sell socks and things. My friend Simone was the first one to get on to it. She was researching before I even started chemo. Her love of online shopping may have had something to do with that. She sent me the link to a website in America. They had so many different types of scarves it all got a bit confusing. I really needed to try them on. Initially I thought I would wear wigs and there are a couple of reasons for that. I thought I could get a few different colours and have a bit of fun with different styles. 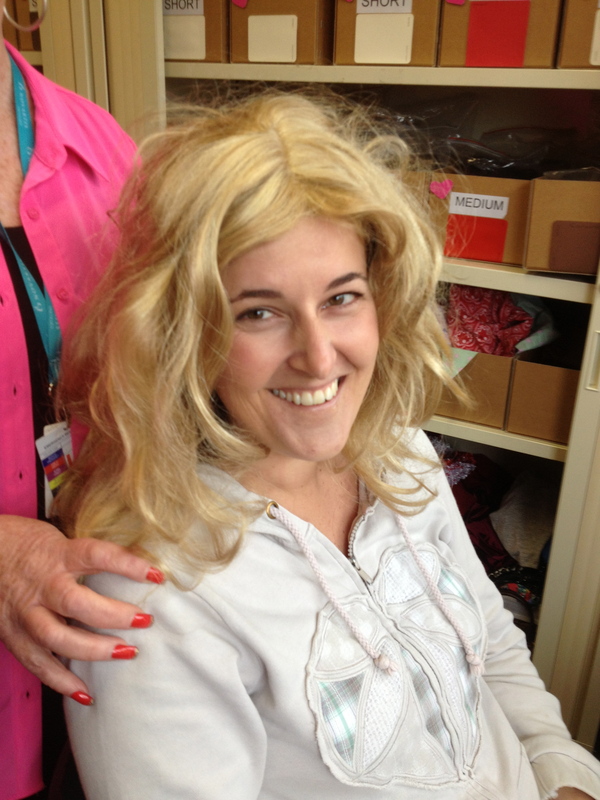 I told a work colleague I would be blonde at his 40th but I didn’t go through with it (not because I was scared, I didn’t find the right wig in time). I also thought wearing a scarf just screams “I’ve got cancer”, but turns out that’s not such a bad thing when you need to use that cancer card. Then I got thinking about the fact that most people seem to wear scarves. Is that because wigs are really uncomfortable? They’d probably be quite hot in summer. I decided a combination of wigs and scarves would probably be best. 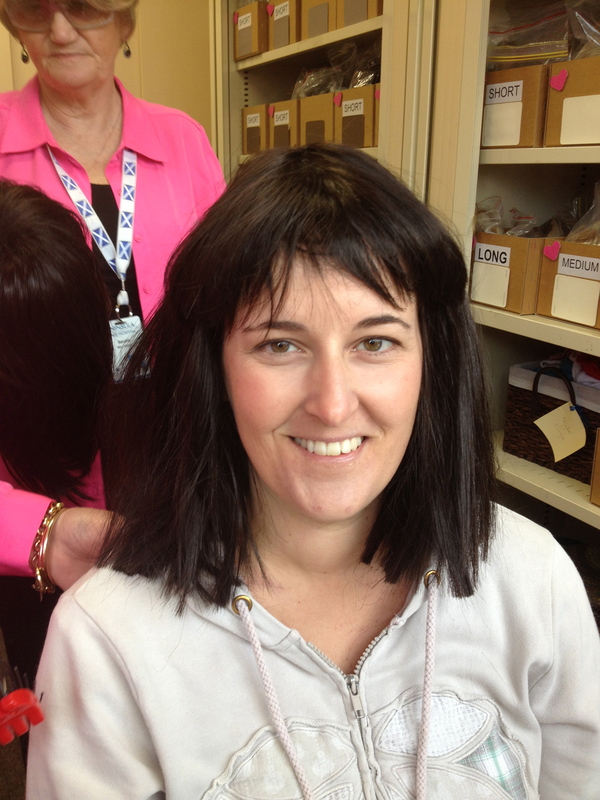 On Wednesday 14th August, which was day 17, I visited the local wig library. 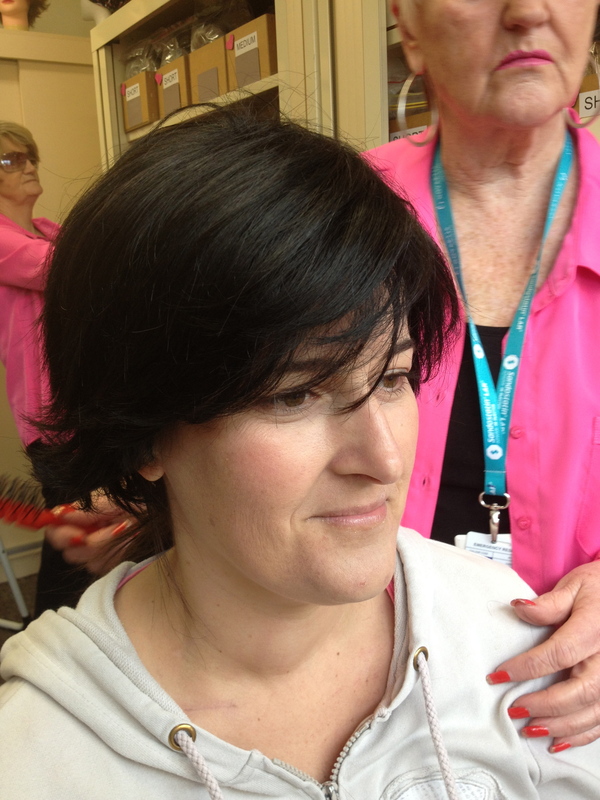 This is a service run by volunteers that loans wigs, free of charge, to people going through chemotherapy. I had been told about this place during my first chemo session. Jenni came to pick me and I remember that I really could not be bothered going, as two days after chemo, the fatigue was starting to set in. I dragged myself there, hoping I might find that blonde wig to wear to the 40th. We were greeted by two lovely older ladies dressed in bright pink shirts. 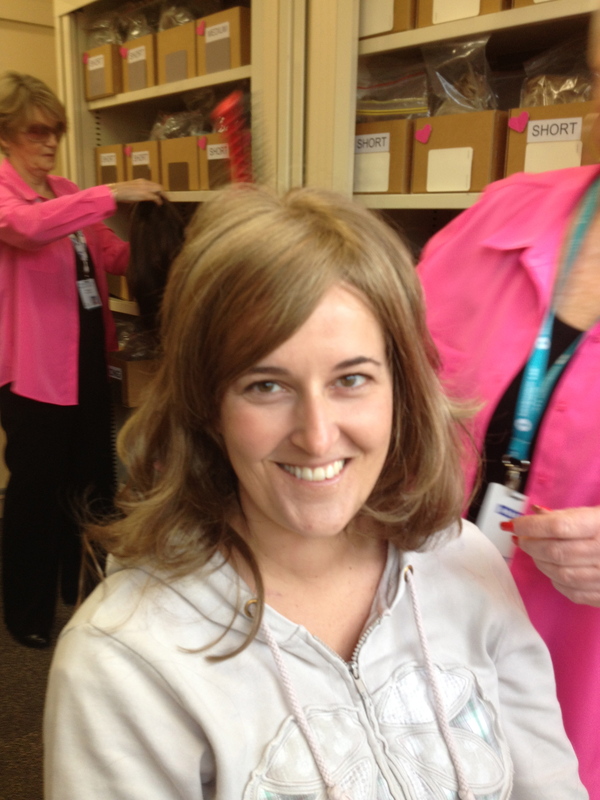 They escorted us to the wig library, sat me down and asked what colour and length of wig I wanted. 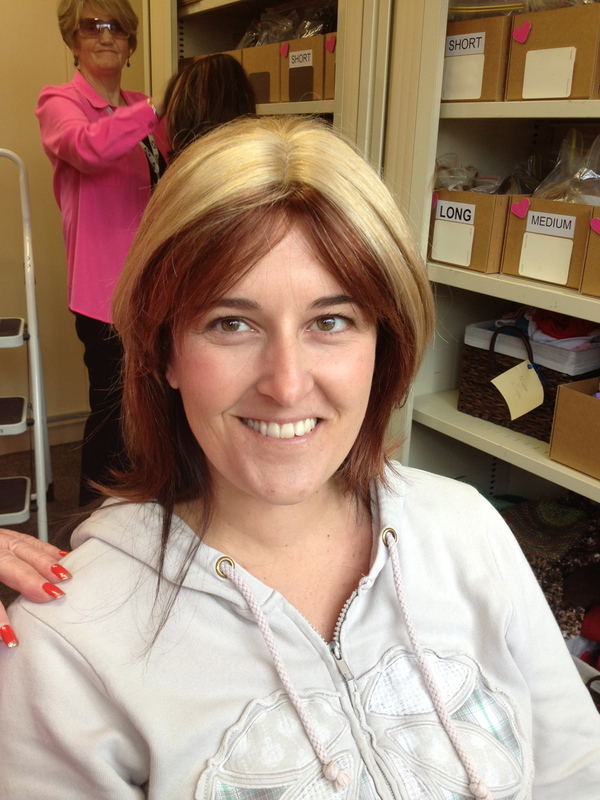 I said I wanted a blonde wig because I wanted to know if it was true that blondes had more fun. 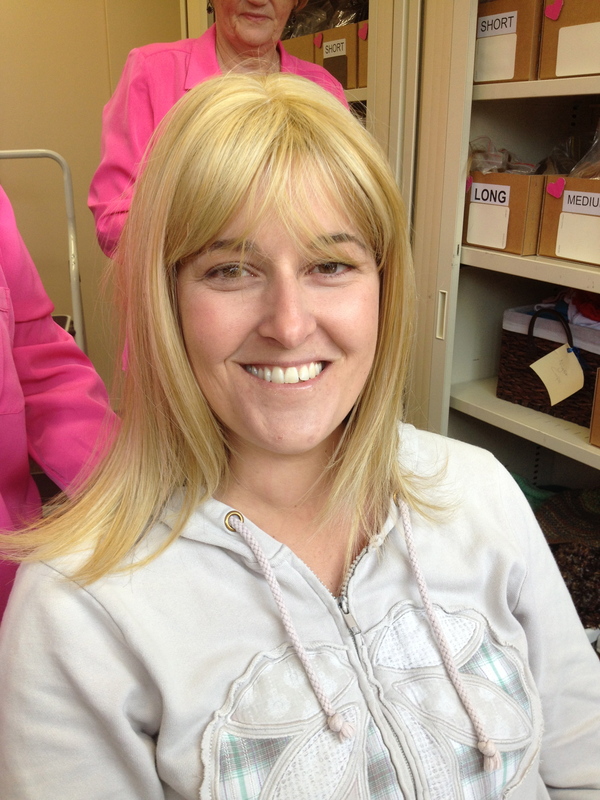 I have to say, they were not too impressed but they obliged and pulled out all their blonde wigs for me to try on. Jenni was there with the iPhone ready, snapping each wig as it was place on my head. Some of these wigs were just atrocious. I am not criticising the service, or these ladies; it is a fantastic service and these ladies were giving their time to help, but some of the wigs were so matted even the ladies were embarrassed about them. You will see what I mean when you look at the photos. I think that’s a sympathetic hand on my shoulder. This was actually the best style they had but I conceded that I might need to wait until my eyebrows fall out before I go blonde. Thank you. Next wig please. 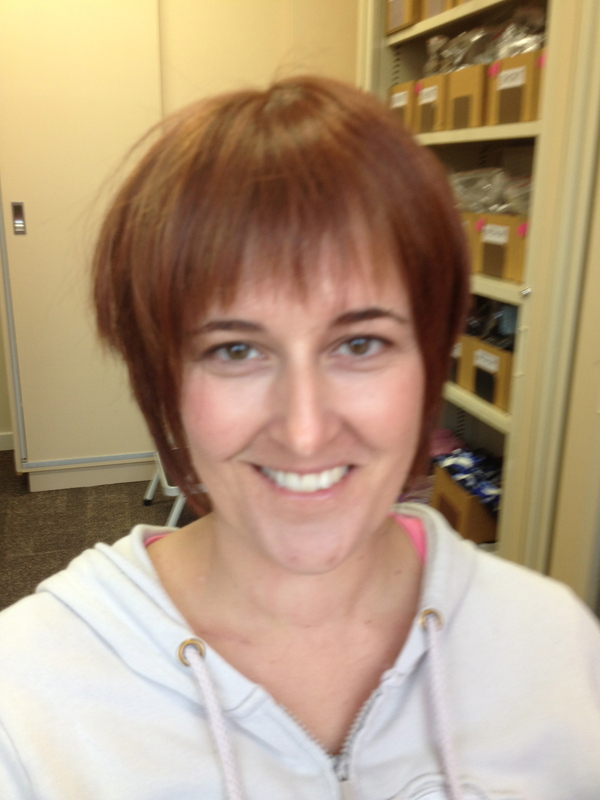 After the blonde range, we decided it might be better to stick with brunette but there was not much on offer. 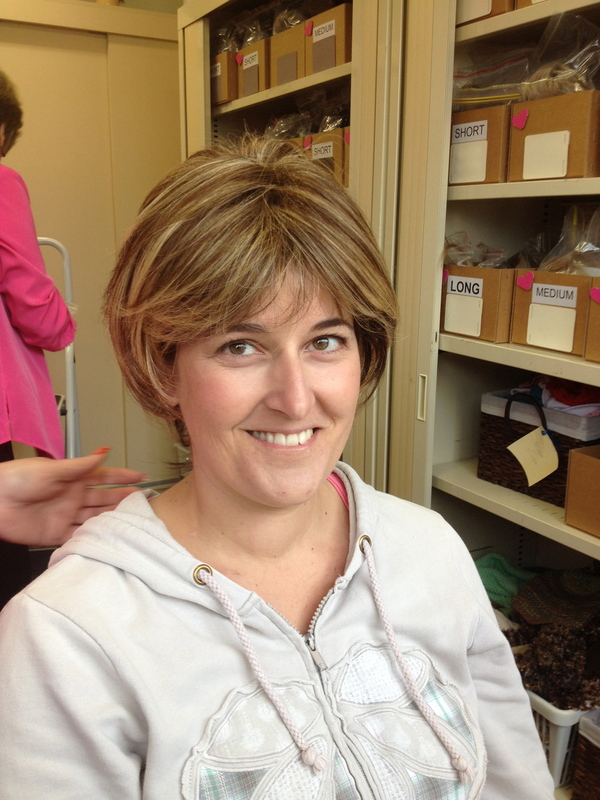 We really weren’t having any success with long wigs so we thought we’d try some short styles. By this stage I think the lovely ladies had had enough of us. Again they weren’t too impressed when I said the only wig I would take is the long blonde one to wear as a joke. They said I shouldn’t be taking one as a joke, I should be taking one that I will wear and that makes me feel good. Unfortunately none of the wigs fulfilled their criteria. I ended up taking the last one, which they said made me look like I’d just walked out of a hairdressers salon. Yes, perhaps after a really bad haircut. They also gave me a few scarves, a beanie and a night cap which apparently I would need to catch all my hair so it didn’t go all over the bed. Again they were all free of charge and had been donated to the library, so it really is a great service. 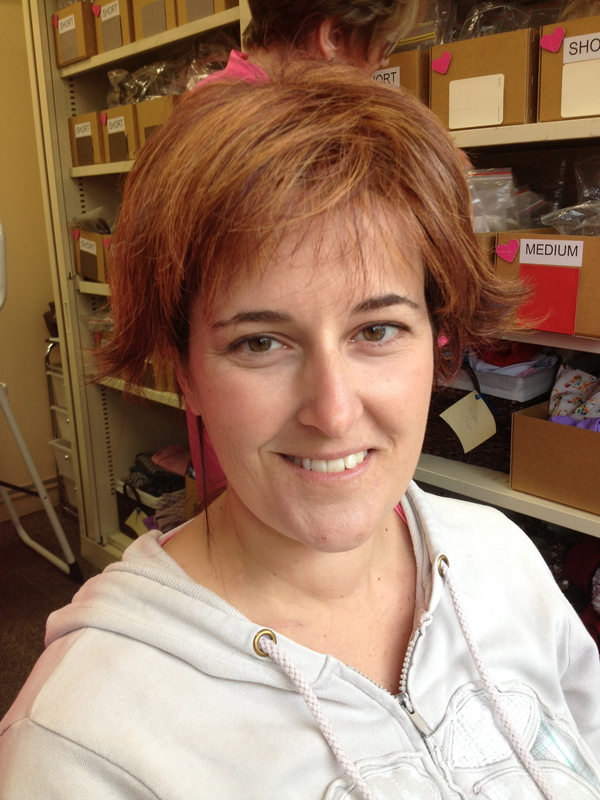 After leaving the wig library, we called in to a hairdresser supply shop as Jenni needed some hair products. That could be deemed as an inappropriate place to go with someone who is about to lose all their hair. Lucky I’m not sensitive! Cousin Turtle, seeing you with blonde hair made me laugh, not to mention reading about as I could just imagine you & Jenni in there. Do you still have Phil’s wigs remember those??? Thanks for making me laugh and smile today. God bless You that’s all I can say, you made me laugh and it felt so inappropriate. Hi Turtle, Thinking of you for tomorrow…Looked at photo 4 and thought I was looking at Cousin turtle in Perth…cannot get over how much you and Bec look alike…Yes I remember nanna Phil’s wig ..Wonder what happen to it and the foam head it use to sit on when she was not wearing it..
Hi turtle, thinking of you for tomorrow….Looking at picture 4 though I was looking at cousin Bec cannot get over how much you and Bec look alike….I remember Nanna Phil’s wig and the foam head it use to sit on when she was not wearing it…..lol I also remember the “Brunch Coats” nanna use to wear also. I love the smile more than the wigs! There are people out there who really have those styles!! !